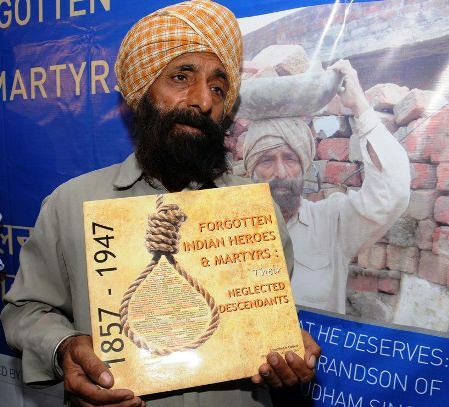 Udham Singh might have borne the burden of avenging one of the most gruesome colonial acts in Indian history–the infamous Jalianwala Bagh massacre–but his descendants were condemned to carry the burden of penury. When journalist author Shivnath Jha located Jeet Singh two years ago, he was working as a labourer at a construction site in Punjab. Jeet Singh is no ordinary Indian but grandson of India”s freedom struggle martyr Udham Singh, who shot and killed Michael O”Dwyer, who as Lieutenant Governor of Punjab endorsed the massacre on Baisakhi day in 1919. 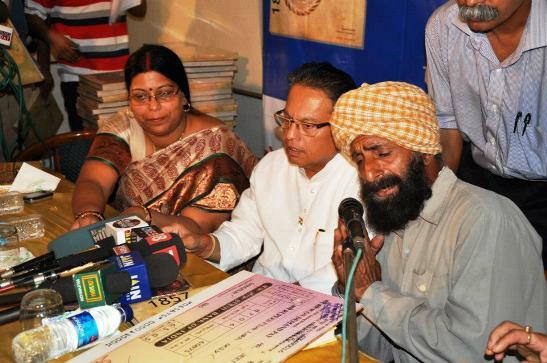 The 55-year-old grandson of Udham Singh lives in Sangrur village of Punjab with his two sons, all of whom live a miserable life despite promises of succour by government functionaries, including late President Giani Zail Singh. 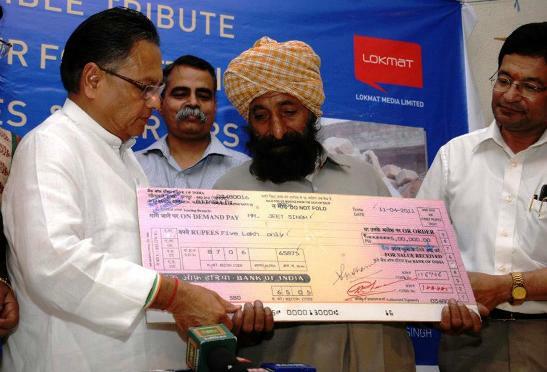 Rajya Sabha MP and founder of the Lokmat media group Vijay Darda today honoured the memory of Udham Singh on the occasion of Baisakhi by handing over to Jeet Singh a cheque of Rs 11 lakh, collected through contributions by his media group and from some individual philanthropists. ”Forgotten Indian Heroes and Martyrs: Their Neglected Descendants-1857-1947”- a pictorial coffee-table book chronicling the lives of more than 22 such families of descendants of the martyrs of India”s freedom struggle, compiled by Jha and his wife Neena, was also launched by Singh and Darda jointly. Jeet Singh was moved to tears at the felicitation and he mumbled “it feels good to be respected and loved by the people of the country”. The book, Jha says, is part of his attempts to bring to light the miserable conditions of such families and bring some dignity to their lives. “There is nothing about Udham Singh in this book that people do not already know. I have but changed the perspective of the story (by encapsulating the present lives of his descendants),” said Jha. The coffee-table book is the fifth in a series of books, which began with a ”Monograph” on legendary Shehnai maestro Bismillah Khan. “The least one would expect any government to do is to identify the families of these heroes and to give them a pride of place in all national functions. Needless to say their education and medical care should be the responsibility of the state,” he said. “The neglect of Jeet Singh is an example of a black page in our system–one of which we have to be ashamed of,” said Darda. “If the government can take care of its Parliamentarians for life, don”t the families of our national heroes need some attention. I hope various state governments will wake up to the cause of such families,” said Darda. Where I can buy this pictorial book? Is there a way to send Financial help to these sons of heroes?